Katherine Ovsiannikova at Edmiston & Company in Greece sends details of charter price reductions on the 36.5m motor yacht AA Absolute. 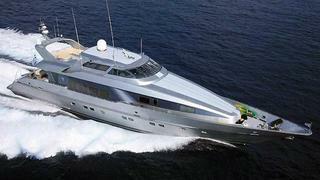 Built by Heesen in 1995, she’s a fine example of quality Dutch workmanship. Refitted in 2007, she features ultra-modern styling and a very spacious interior, accommodating eight guests in a master suite, two VIP staterooms and a twin cabin. AA Absolute offers exceptional performance and is capable of speeds over 40 knots. Her weekly charter rates in the Eastern Mediterranean in June and September are €45,000, down from €55,000 and in July and August €60,000, down from €70,000. AA Absolute is also listed for sale by Edmiston asking €3.75 million.